Because I was teaching this semester, I wasn’t able to host Thanksgiving this year. But I still wanted to make something to bring and share…but what? I wanted something new, but something that would still fit with the Thanksgiving spirit. Inspiration struck in the form of an email with the new seasonal menu for one of my favorite restaurants. There, under the desserts, they were featuring a cranberry upside down cake. 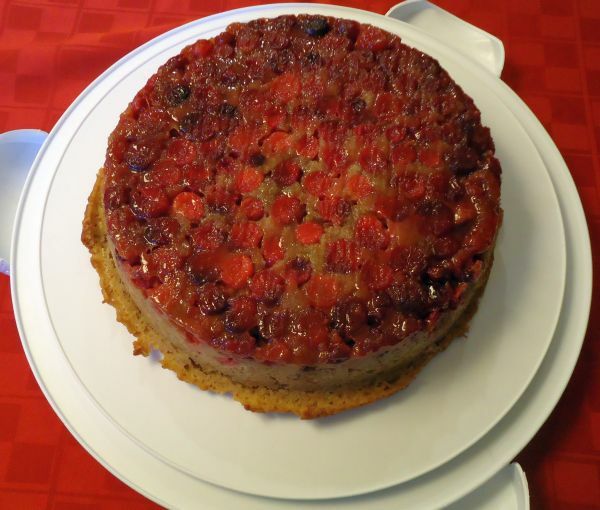 I had never really thought of making an upside down cake before, much less one with cranberries. I had always pictured upside down cakes with rings of pineapple, and they had never seemed particularly appealing to me. But cranberries…cranberries had possibilities! The first order of business was figuring out how to make the cranberries stick to the top of the cake. Flat pineapple slices would sit on a cake fairly well, even with an imperfect “glue” but cranberries seemed problematic to me. 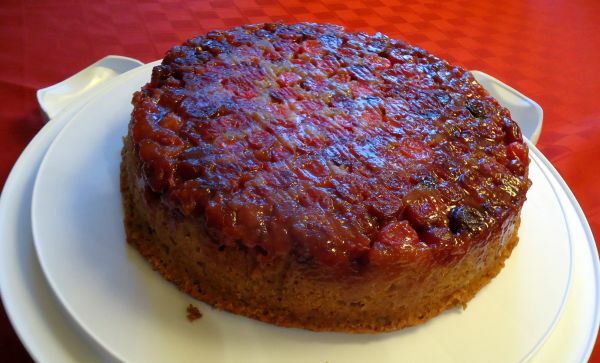 So I asked Google for some help and read through a bunch of different upside down cake recipes and learned that in almost all of them the “glue” is basically just a caramelized sugar and butter mixture that you pour in the bottom of your cake pan, and then press the fruit into before it hardens. Seemed fairly easy to me! Then there was the cake to figure out. Most upside down cake recipes called for some variety of plain cake (white, pound, vanilla, etc) to support the fruit. On the one hand this makes sense–you want the fruit to be the star of the dish. But I wanted something different. I wanted something more than just a blank slate with fruit on top–I wanted something that would work together with the cranberries and enhance them. Answer? Spice cake. When I make cranberry sauce, I add a whole host of spices to the pot, so I figured the same idea would work for the cake. But I needed somewhere to start. Luckily, I came across Smitten Kitchen’s recipe for Spiced Applesauce Cake. I wasn’t entirely sure it would work, because, never having made an upside down cake before, I wasn’t sure how stiff of a cake you would need to hold up the fruit. 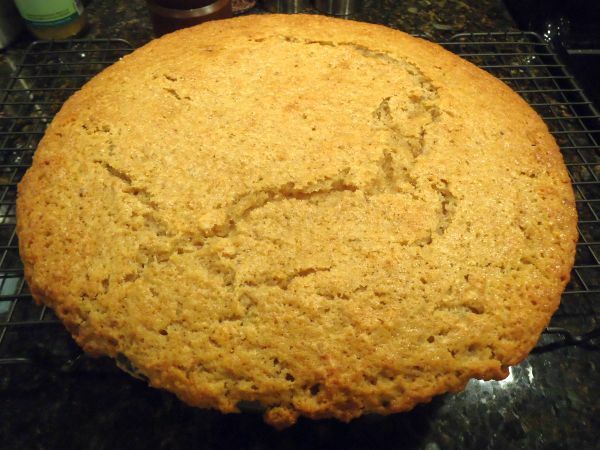 (And never having made the applesauce cake before, I was also unsure how strong it would turn out to be.) I also wanted more spices in the cake than that recipe calls for (because again, I put a LOT of spices in the pot when I make cranberry sauce) so I decided to wing it a bit, and just use the recipe as a guide. In the end, the final product came together beautifully. The cake was moist and well-spiced without being overpowering. The cranberries stayed neatly in place in their single layer, their tartness marrying beautifully with the sweet, aromatic cake. 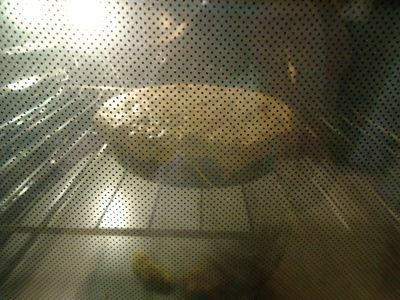 The one flaw was that in the attempt to not waste any cake batter, I overfilled the cake pan a bit and it overflowed. Luckily I caught it before *too* much dripped down, and stuck a sheet pan on the rack below to keep it from getting on the heating element and burning. Note: You can either make this cake in a 9′ cake pan or a 10′ cast iron skillet. I made it in a cake pan, and had slightly too much cake batter. It would most likely all fit in the skillet. The advantage of using a cast iron skillet is that you can caramelize the butter and sugar right there, as opposed to needing to pour it from a saucepan into the cake pan. On the other hand, using the cake pan, I was able to line the bottom with a disc of parchment paper, which made for easy extraction. It’s up to you. In a small saucepan (or your cast iron skillet) melt the butter for the topping over medium heat, and then stir in the brown sugar. Keep stirring constantly as it simmers for 4-5 minutes. The color should darken some, but don’t let it burn! Pour it into your parchment-lined cake pan if you’re using one, and then spread the cranberries over the top in a single layer, packing them in tightly. (You could even arrange them in a pattern if you wanted to be fancy.) Do not touch the sugar/butter mixture. It will burn you. Set the pan aside. Whisk or sift together all of the dry ingredients in a small bowl. Set aside. Then, in a large bowl, beat together the brown sugar, vanilla extract, and softened butter–keep going until it’s light and fluffy. (You’re going to want to use an electric mixer/stand mixer to do this unless you want a really good workout. Because it takes a good 2-3 minutes on high to achieve proper fluffiness.) Then beat in the eggs one at a time, and finally beat in the applesauce. Then mix in the dry ingredients until just combined. I did this by hand because my mixer doesn’t have a setting that’s low enough to avoid a flour explosion. Pour the batter over the cranberries in the cake pan/skillet. Even if you have a little batter left over, do not overfill your cake pan. Bake the rest into a little spice muffin if you like. Put the cake in the oven on the center rack, and put a sheet pan on the rack below (just in case you did overfill), and bake for 35-40 minutes until a toothpick in the center comes out clean *and* the center of the cake feels springy when you press on it gently (i.e. doesn’t feel like it’s a crust sitting on top of liquid). Make sure you do both tests–toothpicks were coming out clean significantly before the center of the cake was fully set. Cool the cake in the pan on top of a cooling rack for 15-30 minutes or until you can easily handle it with your bare hands. (Even longer won’t hurt it.) Gently run a knife around the edge of your cake to loosen it in the pan. Then take your cake plate, put it upside down on the top of your cake, and flip. The cake should slide easily out of the pan. If you made it in a cake pan with parchment paper, gently peel off the circle of parchment. Cool completely and enjoy. Store leftovers in the refrigerator–it makes an excellent breakfast the next day!